Signing off and toasting: To more awesome (and “imaged”) credible health content for the internet! Originally published August 2017; updated with even more awesomeness September 2018. 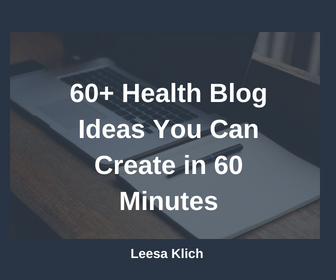 Want to know where to get health blog images, and how to make them work for your blog? By “work” I mean, how to use them to promote your blog in search engines and social media? You know that images are SO important! Do you remember back in the days of dial-up internet, when everything took foreeeeeever to load? Images on the internet slowed that process down. And you don’t have to stop at just one image for each blog post – do more. They should complement your topic, break up your text, and make it easier to read. Make every image clickable and shareable. Don’t forget to promote them on social media. Before I share some of my favourite places to get images, here are some pretty important tips for you. PRO TIP: One study found that the top 100 shared blog posts have an image every 350 words or so. That helps you calculate approximately how many images to strive for – one per 350 words! In fact, in some of my more recent blog posts, I’m adding an image for every level 1 heading. PRO TIP: Make sure you have permission to use the image. Don’t just pull one off the internet and use it. Depending on the image and owner of the image, it can cause you lots of trouble, including steep fines. Copyright infringement can be a big deal, so just don’t go there. Make sure to give your images “alt-tags” when you upload them. This is the text that shows up if images don’t load properly and for people who are visually impaired. They will also help your post get found on search engines like Google. Ideally, your blog post title, url, and image tags will all contain a version of that post’s main keywords. This is one more thing you can do to help rank your post in search engines. Make images shareable by others who visit your blog. I personally use the free plugin Frizzly that makes those three shareable links when you hover over an image. PRO TIP: If your images seem to slow down the loading of your website, try a plugin that makes them smaller. Right now, I’m using Smush. Especially if you’re looking for photos of yourself. For social media, of course, selfies can rock! Maybe even for extra images peppered throughout your blog, or your profile pictures. But not for your website home and about pages, and social media headers. For those, I highly recommend you “go pro.” If you’re in Toronto, you might consider my sister’s online portrait photography appeals to you. There are tonnes of sites that offer free or inexpensive images (always check the “attribution” before using). Think about your branding, and how you want to be perceived and remembered. Clipart? Nope! Get a nice theme going and run with it. You may notice how much I love images of food and books. And that suits my branding of being a science-based researcher/writer. But you can search these sites for everything from almonds to zinc. PRO TIP: Always make sure that the images you download, even if they’re free, are free for commercial use and not just personal use! Once you have images you should brand them a bit. I use Canva, and they have a “design school” too. First I choose an older image as a template (or start from scratch). Add one of my brand colours as the background. Then I upload my image and put it on top. On top of that, I layer a square of my signature colour & play with the transparency. Then I put the title of my blog post smack in the middle. This is so it can be read on social media thumbnails. Did you ever notice that some images are cropped in your social feeds? Me too! So add your title right in the middle. You can also add your name, website, or logo underneath as well. Name it. Save it. Download it to your computer. Upload it to your website’s “Media” storage & add to your blog post. Promote your blog like crazy – seriously! Probably more than you have been. Share in your social media feeds, and do it often! Click for my personal promotion strategy for every single evergreen blog post. Whichever of your social media shares is the most popular – consider turning it into a paid ad! And make sure you have an opportunity to collect email addresses from your readers when they click through to your post. I have a lot of tips here on how to make a great post into a list building machine. For example, have opt-in boxes on your post (perhaps with content upgrades) and a popup. 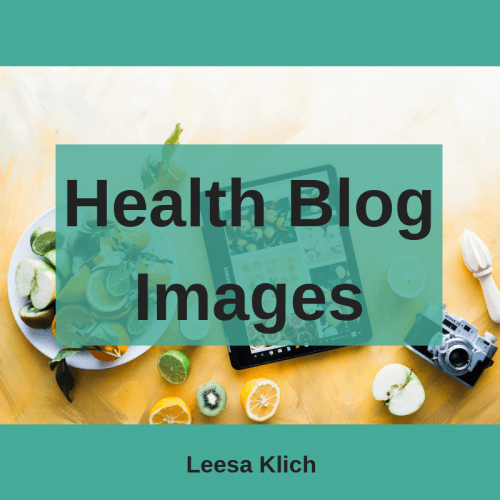 Do you have a favourite place to get your health blog images? If so, did I miss a great resource? What program do you use to customize your images? Let me know in the comments and I’ll personally reply! Leesa, thanks for your recent email noting and linking to this article – this article was very, very helpful – quite practical. It gave me a strategy, and checklist of sorts, to implement right away as I’m about to launch my very first blog post. I thought of just using one image but after reading this I upped it to four. And I’ve begun to use pexels and pixabay and they’re great. I’m so glad this blog post helped Robert! Yes, several images is a great plan for each blog post, and easy enough to do. Thanks for your comment, and all the best for your new blog!